When I go in bars and ask for a beer, I’m often greeted with the response, “A big beer?” This of usually accompanied by hand gestures meant to signify the presence of a large glass. Today I had the biggest glass of beer I ever drank in my life. It contained a full litre of local Albanian beer. 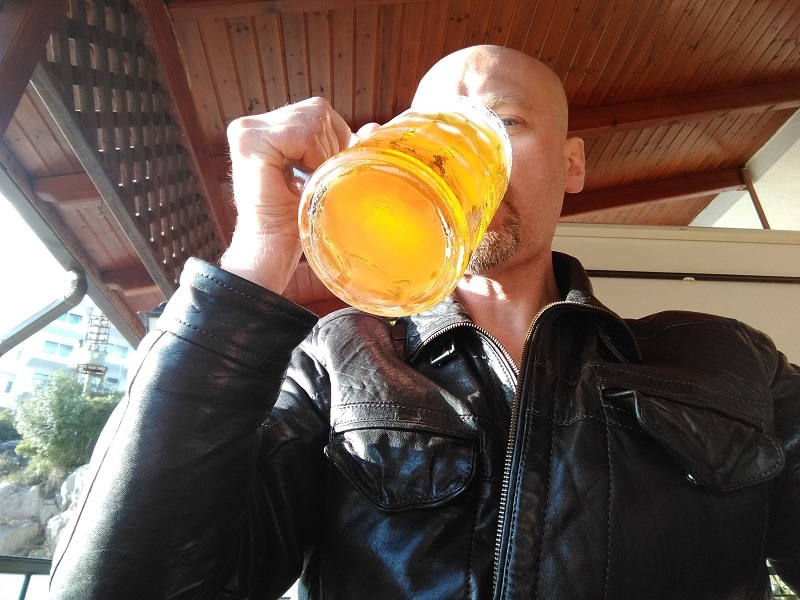 Before I began travelling, I always thought Germany was the place to go for a beer served in a one-litre glass. However, although I have heard there are areas of Germany where this is quite common when I was in Germany last year the opportunity never arose. In Leipzig, everyone appeared to drink from glasses that were no larger than a British pint glass. In many bars, people were drinking from glasses that were somewhat smaller. During the month I spent living in Duisburg I never saw any signs of one-litre glasses either. All of the locals seem to drink from glasses that are no bigger than a Dutch vaasje, which is similar to a British half-pint. The apartment I’m renting in Saranda is not far from a bar called The Beer House. If you want a vaasje or a “pint”, both sizes are available. You can also order a litre of beer and they keep the glasses in the refrigerator. 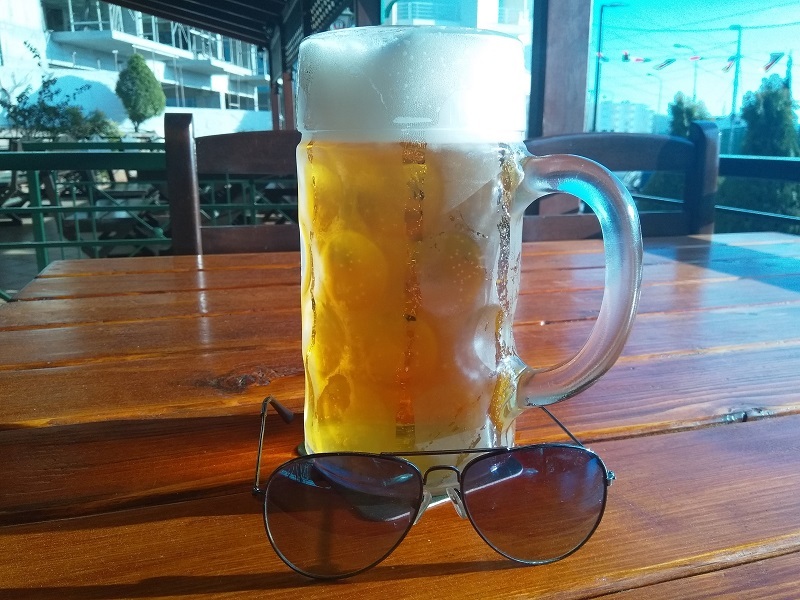 So, anyone who buys a big glass of beer at the Beer House in Saranda can always be sure their drink will be nice and cold. This is the first time I’ve had the opportunity to try drinking from such a large-sized glass so, when I went to the Beer House [MAP] earlier today, I gave it a go and ordered a litre of Kaon beer. The Kaon brewery is further up the coast in the city of Vlorë. It’s the fourth largest brewery in Albania. The largest is Birra Tirana. I’ve tried a few different Albanian beers since I arrived in Saranda a couple of weeks ago. Mainly, Kaon, Korça, Tirana, Stela, and Elbar. I don’t claim to be a beer expert, but I do like Albanian beer. Drinking from such a large glass was an interesting experience. It felt a lot heavier than I expected and watching me drink from it appeared to be a source of amusement for the locals. Although the Beer House offers the option to “go large”, drinking from such over-sized glasses is not an Albanian thing. Nor have I seen the option in other bars in Saranda, though it’s possible some of them may have one-litre glasses too. A lot of tourists visit Saranda during the Summer. Some of them come from Germany, so it would make sense that the bars can offer them a beer that’s as big as the ones they are used to drinking at home. For me, one liter of beer is a little too much. I’ve spent a lot of time living in the Netherlands. When I’m there, I drink from a vaasje like Dutch people normally do. Keeping it small also makes it easy for me to drift from bar to bar. My first drinking experiences were in Bedale and Darlington, where it’s normal to go on a pub crawl. I’m not one for spending too long in a single bar. Trying to do a pub crawl and drinking a litre of beer at each stop would be impossible. Today, I just wanted to try drinking one beer from a big glass and then go home, so that’s what I did. It was an interesting experience and I dare say I may try it again if the option arises next time I’m in Germany, but drinking from such large glasses is never going to be my thing.